For those at the Balconiers Buffet Evening held at St Helen’s on the 22nd June 2018 may recall that Dr Andrew Hignell presented John Williams with the first copy of a new book shortly to be released, well it was released yesterday and is available from The Association of Cricket Statisticians and Historians at £18. This book by Andrew Hignell and the late Bob Harragan is the fifth in the highly acclaimed Cricket Witness series and its publication, during the summer of 2018, celebrates the 50th anniversary of Sobers’ feat at the Swansea ground against the occasional spin of Malcolm Nash. 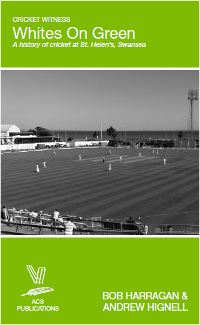 Besides recounting all of these feats, and a number of other memorable occasions in cricket history at St Helen’s, this book also traces the creation during the second half of the 19th century of the ground – used by Swansea’s cricket and rugby teams – and its integral place in Welsh sporting history. Lavishly illustrated with many hitherto unpublished photographs, this book will appeal to local historians as well as aficionados of the summer game, besides showing how popular outgrounds and cricket festivals have been in the county cricket calendar.